All food is cooked at each venue by an experienced staff member, who will hold a current food safety standards training certificate. We use organic and fresh seasonal produce whenever possible. A breakfast or afternoon snack is provided depending on the session your child attends. Water or milk is served with breakfast with the addition of juice with the afternoon snack. All venues operate a three week rotating menu, which is altered seasonally. 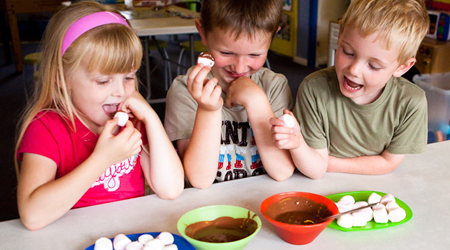 Children where they are encouraged to experience different foods. All venues have themed food weeks which often link in to cultural celebrations such as Chinese New Year. We work as each child’s development partner. 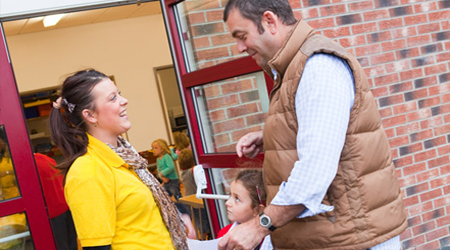 Each parent receives regular, informal updates on their child’s progress at collection time. Each child at Wasps has their own Child Development Chart. Each child from 3-36 months has a Daily Routine Sheet, which is presented at the end of each session. This includes observations and picture evidence if consent has been given. Our Parent Information Board displays activities taking place during each month, parent notices, menus, and our newsletter. Children who attend for only a few hours a week have a scrap book which contains their work and pictures. We welcome babies and children who are in nappies as well as those who are toilet trained and we are also able to encourage those who are ready for toilet training. 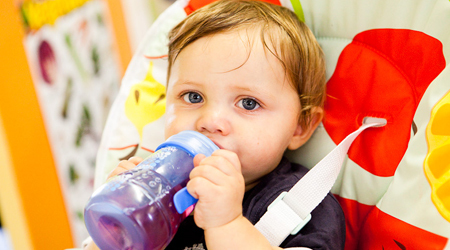 All Wasps nurseries have small, child friendly toilets and staff are on hand to help when your child is ready.